WHY DID THE CHICKEN CROSS THE ROAD? … BECAUSE THE ZAPATISTAS WERE AFTER HIM!!! 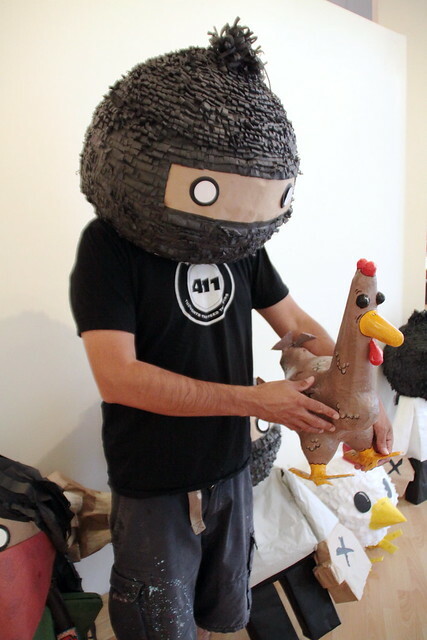 Come check out all the hype about Chickens and Zapatistas this Saturday at 1:AM gallery for the opening of “THE REVOLUTIONARIES” featuring new works by Cache and EyeOne. Producing beautiful symbolic murals in areas that tend to have no voice, these street artists are the epitome of “freedom of speech”. Their voice is strong and powerful yet very approachable. 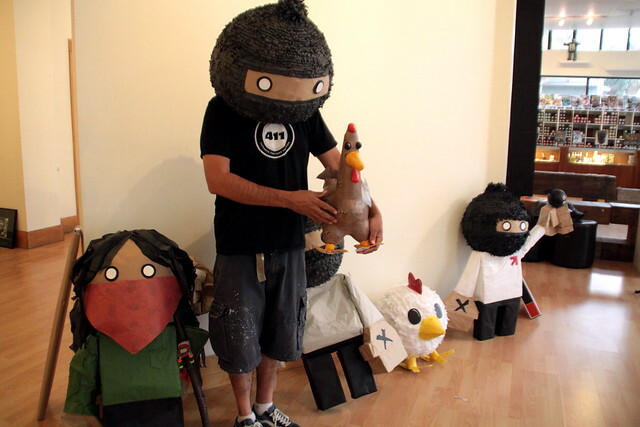 The characters they paint, like Cache’s Chickens, represent people in society who address pertinent issues that are plaguing communities’ minds through a fun and energetic style. Join us for the opening on Saturday, August 7th, 2010 from 12 – 6:30pm. This will be our first ever opening during the day and we want ALL ages to come on by and join in on the fun! We invite the little tykes to bring old t-shirts, bags, shoes or whatever they want to add funk to so they can customize their environment by stenciling characters being exhibited in the show! Grown-ups can have fun too by chomping on complimentary bites and sipping on VitaminWater’s revitalizing flavors. The opening reception is on August 7th from 12 – 6:30pm and will be on display through September 4th, 2010. Come with us on a journey to freedom, peace, and love through art. Stand for something or fall for anything! BE HERE. THIS SATURDAY, AUGUST 7TH, 12-6:30PM!!! « OUT WITH THE WIZARDS, LIZARDS, AND BROADS… IN WITH THE CHICKENS AND ZAPATISTAS!! !